IRVINE — An Irvine resident is requesting that the city install a sign to memorialize a truckload of saltwater bass killed in a traffic accident Oct. 11. The fish met their early demise while they were being trucked to the 99 Ranch Market at the intersection of Walnut and Yale streets. Fish storage tanks were cracked in the accident there, draining out their water supply. No human injuries were reported at the time of the crash. 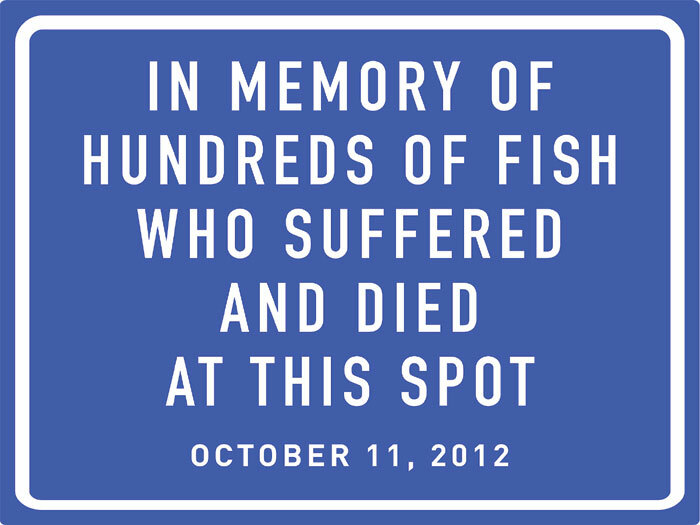 When Dina Kourda, a volunteer with People for the Ethical Treatment of Animals (PETA), heard about the incident, she wrote a letter to the city, asking for a memorial to commemorate the loss of several hundred fish lives. Kourda cited research showing that that fish use tools, tell time, sing, and have long-term memories and complex social structures, and she questioned the food industry’s tactics in preparing fish as food. “Sparing them from being tossed from a speeding truck and slowly dying from injuries and suffocation seems the least that we can do,” she stated. PETA senior campaign coordinator Laura Cascada said the group is still working with city authorities to get the sign placed on the site. In the past, PETA has tried — without success — to get signs erected in various other parts of the country for traffic incidents involving the deaths of animals. Cascada said memorials have been proposed in other states for both cows and pigs, but this would be the first attempt to get a memorial in place for fish. “We want the sign there to memorialize this incident, and for customers to realize that every animal feels pain,” Cascada said. According to a Los Angeles Times report, city of Irvine spokesman Craig Reem said there are currently no plans to place a fish memorial at the street corner.